Posted on October 24, 2018 at 11:58 pm. 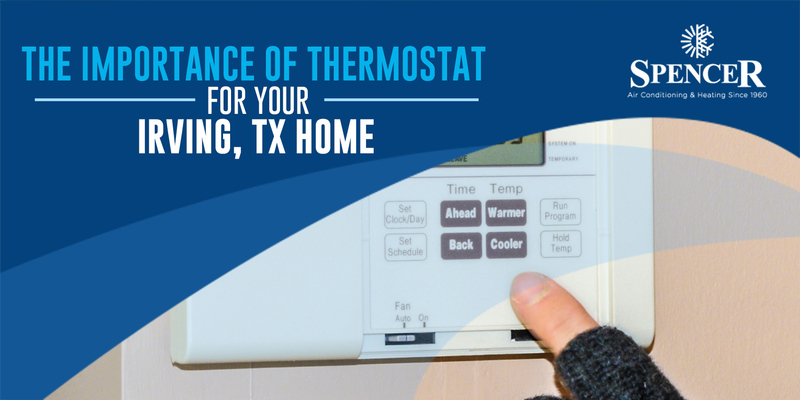 Thermostats are the unsung heroes of most homes in Irving, TX. With their ability to control the HVAC system and adjust the indoor temperature, many homeowners did not realize that their thermostats are the reason why they experience optimum comfort right now. But there is more on this device than just offering comfort in your living space. It is not hard to burn through money when home comfort is concerned. Given the fact that home heating takes up much of the percentage in energy consumption, saving money seems so hard to achieve. But with a thermostat that helps control the indoor temperature and energy consumption, saving money and lowering your energy bills can become possible. Instead of cranking your heating unit high during the cold season and pay for its cost when the heating bill comes, you can use a thermostat to get a consistent indoor temperature and pay only for the heating energy you used. This means your heat will stay steady as it affordably follows the programmed temperature setting. Modern thermostats like the smart ones come equipped with different state-of-the-art technological tools that make controlling your indoor temperature a simple task. All you need to do is download the app and set the temperature using your smartphone and Wi-Fi connection. With these modern devices, you can now virtually adjust and set your home temperature from anywhere, anytime. Thermostats can help curb the wasted heat and let your unit run efficiently. When the cold season comes, you will be thankful that your thermostat is there to manage your indoor temperature and control your energy consumption. Zoning can help you manage the temperature in every room of the house while increasing energy efficiency throughout the cold months. With the programmable control in every zone, you can freely customize the temperature in your home’s square footage. Smart thermostats can eliminate all the hassles of manually adjusting the temperature in your property day by day. With their features, all you need to do is set a one-time schedule per season and leave it that way. This means you can focus more on the things that seem important to you. If you believe you need a thermostat for your home before the winter season, make sure to talk to the right people to configure the device with your current HVAC system. Our professionals here at Spencer Air Conditioning & Heating are more than happy to serve you with all your thermostat needs. Call us to get started!